Media entrepreneur Steve Brill and former Wall Street Journal publisher Gordon Crovitz have launched NewsGuard, a startup that rates online news outlets on their reliability in an effort to fight fake news. NewsGuard analysts will look at 7,500 news sites and assign green, yellow and red "reliability ratings." These sites selected by NewsGuard account for 98% of the news articles read and shared in English online in the United States, according to the company. The idea is that the ratings will make it more clear to those who get their news via search engines or social-media platforms which sites are trustworthy. It will also whitelist news sites as safe spaces for advertisers to associate brands with, so that they can avoid advertising on fake news outlets. NewsGuard raised $6 million in funding to launch this initiative. The startup has 18 investors, led by Publicis Groupe, a multinational ad agency. “For us, NewsGuard is highly appealing because it is a concrete, actionable answer to our clients’ concerns — another layer of protection for them,” stated Publicis Groupe chairman Maurice Levy. The ratings will pertain to each site’s record as a news source, rather than a specific article or journalist. A “green” rating will be given to sites with content “produced by people who are trying to communicate news, information and opinion that they believe is accurate, and who adhere to practices aimed at assuring basic standards of accuracy, as well as accountability,” according to the NewsGuard site. And red sites “are the deliberate purveyors of what has come to be called ‘fake news,’” with the intention of deceiving readers. “Their goal is typically either profit (to reap advertising dollars by getting the most clicks from the most outrageous headline) or to advance disinformation or propaganda (the purposeful distribution of false reports to mislead the public),” the site reads. 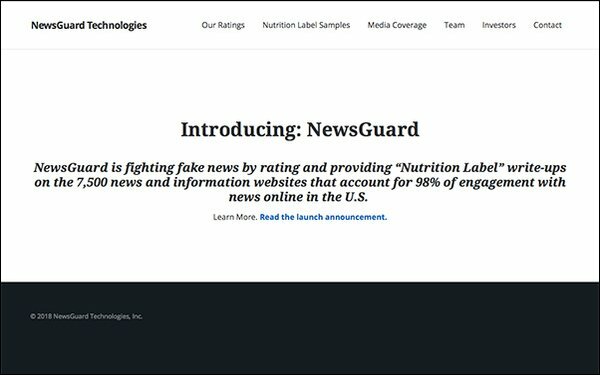 NewsGuard’s analysis will extend beyond those ratings to “nutrition labels" as well. The labels will provide information about the news outlets' founders, ownership, editorial leadership, awards and relevant controversies or notable stories from the publication. So far, NewsGuard has reviewed less than 10 sites, including: BaltimoreSun.com, DenverGuardian.com, NationalReview.com, Lawfareblog.com, GAO.gov, What-is-fracking.com, CommonwealthFund.org, NPR.org and RT.com. Former managing editor of the Chicago Tribune James Warren will serve as executive editor. Eric Effron, formerly of Reuters, The Week and Legal Times, will be managing editor of NewsGuard. Brill, founder of law magazine American Lawyer, Court TV and the former Brill’s Content magazine, told The Washington Post the company expects to hire three or four dozen staffers and freelancers. “Our goal is to help solve this problem now by using human beings—trained, experienced journalists—who will operate under a transparent, accountable process to apply basic common sense to a growing scourge that clearly cannot be solved by algorithms,” Brill stated. NewsGuard hopes the ratings will one day appear in Google search results, shared article posts on Facebook and Twitter, and on YouTube videos. Users may get to add a plug-in to display ratings for each news site they access, too. NewsGuard will make money by charging licensing fees to social-media platforms, online search companies and aggregators.